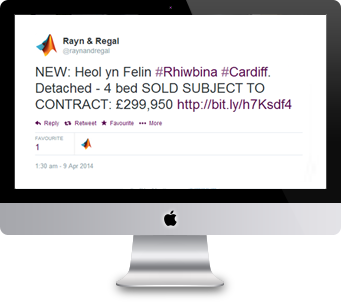 Social media for estate agents is your springboard to instant and cost effective advertising. The advent of social media has revolutionised the way estate agents communicate with prospective buyers, sellers, tenants and landlords, making it easy to post instant updates and benefit from real-time engagement with your target market. More traditional forms of advertising have always been hit and miss, with a strong likelihood of wasting money on unseen adverts, or ads that fail to reach the right people. Social media allows you to target recipients more cost effectively, with direct updates sent only to recipients who are interested in a particular property type or location. If you don’t know your tweets from your Facebook ‘Likes’, AgentPro is here to help. Social media management is just one of the tools you’ll receive when you sign up for our specialist estate and letting agent software. Our social tools allow you to create your very own social media presence, providing all the expert assistance you need. Create Twitter and Facebook accounts – If you are yet to join the social media revolution, our team will create a personalised Twitter and Facebook account for your agency. Integration with existing accounts – You may already have a social media presence, in which case our team will integrate your existing accounts to the AgentPro software package, allowing you to benefit from our range of social media features. Automated tweets – Once we have integrated or created your Twitter account, AgentPro will send an automated tweet to interested parties when a new property comes on the market, or there’s a change in its status including a reduced price, going under offer, exchanged or let. Even hashtags are automatically generated – so users searching for houses for sale in certain areas will easily find your tweets. Automated Facebook updates – Details of new properties or a change in status are sent directly to your Facebook page where they can be viewed by prospective buyers or tenants, and shared amongst their friends. This is an easy way to keep your Facebook regularly updated without doing a thing! Facebook Search Feature – your Facebook fan page can actually be used for house hunters to find their perfect new home. We’ll install a search feature onto your page and the potential buyer can search for houses just like they would on your website or a property portal. They can narrow their search by price or area, and they can share property listings with any users on Facebook they think might be interested. This will then show up on their friend’s Facebook pages – which means even more eyes on your listing. Tweet or update Facebook manually using our builder wizard – AgentPro’s integrated social media builder guides you seamlessly through the process of manually creating your own advertising tweets and Facebook updates, complete with saved hashtags. This is an easy way to personalise a listing and get properties even more views..
We also offer a separate estate agent social media package, where we implement and even manage your very own social media campaign. Our in-house social media experts find fun and engaging ways to transform your social media accounts into an informative and engaging resource, integrating unique and original content to build brand awareness and increase visits to your website. If you’d like to see social media for estate agents in action, please call 08456 444 446 or complete an enquiry form to arrange your free, no-obligation AgentPro demo.